Erith lies on the banks of the River Thames in the area now covered by the London Borough of Bexley. The history of the town is inextricably bound up with the river � indeed, there was once a royal dockyard just to the north-west of the present town centre. The name Erith dates from Saxon times and means �muddy harbour� or �gravelly landing place�. The earliest reference to the area is in a Latin charter of 695 recording a grant by the Bishop of the East Saxons of certain lands at Erith. In early times the area may also have been known as Lesnes or Lessness and the ruins of Lesnes Abbey (see Thamesmead), founded in 1178, are still visible today. The reign of Henry VIII (1509 � 47) brought changes to Erith. The king, who is thought once to have spent a night in the town on his way to France, founded part of his naval dockyard at Erith, at the eastern end of West Street (roughly where the Riverside Gardens are now) and his famous warship, Henri Grace à Dieu or �Great Harry�, was fitted out there in 1515. 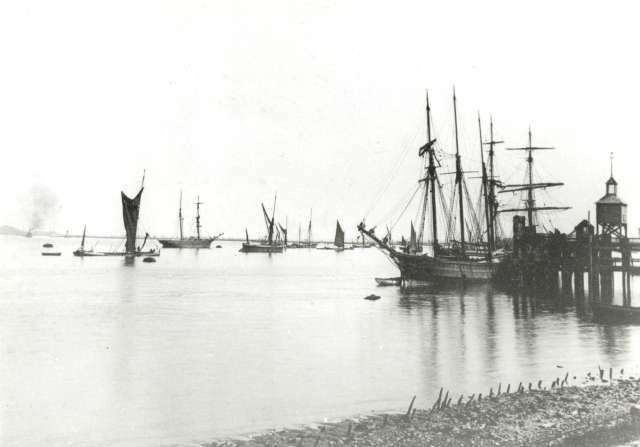 Erith enjoyed a short period as a riverside resort during the middle of the 19th century. Its pier and accompanying hotel catered for the many daytrippers who visited the town on Thames pleasure boats or via the railway, which arrived in 1849. But at the same time the area was becoming a major industrial centre, largely due to the presence of the docks and the proximity both to the open sea and to central London. As a result Erith has a great industrial heritage, particularly from the Victorian period when entrepreneurs such as William Anderson and Charles Beadle made the town one of the most important industrial areas in the south-east of England. Engineering was the prominent industry, with armaments and cable production to the fore. Vickers was an important employer in the town and was linked to the Royal Arsenal at nearby Woolwich. Callenders Cables supplied the world with high-class cable and also laid an underwater pipeline across the English Channel. Fuel supplied through this pipeline was used by Allied vehicles during the D-Day landings on 6 June 1944. 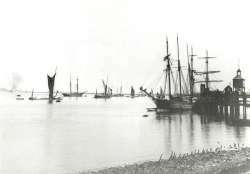 The Victorian period could be said to have been Erith�s golden age, during which what had been a small port grew to become a large town. The population rose from a meagre 2082 in 1841 to 25,296 by 1901. Smaller terraced houses around the town centre were built for the workers employed in the many local industries while larger villas were built on Bexley Road and The Avenue on higher ground away from the centre of the town. Erith suffered heavily from bombing during the Second World War because of its proximity both to the river and to the Royal Arsenal (see Thamesmead). Partly due to this and to the decline in local trade after the war there was a major redevelopment in the 1960s. Unfortunately many of the original buildings were lost but some of the original townscape remains, from the White Hart in the High Street through to St John�s Church in West Street.